It was the morning of Christmas Eve. We get the day off so I slept in until 8:30. I had some oatmeal and was cleaning things out of my computer when there was a huge crash from the living room. Mija, asleep in the chair next to me, bolted to her usual place when there is a strange noise, under my bed. It was clear to me the cat tree had fallen over. Where was Pilchard? What had she been doing which would have caused the tree to tip? Was she okay? 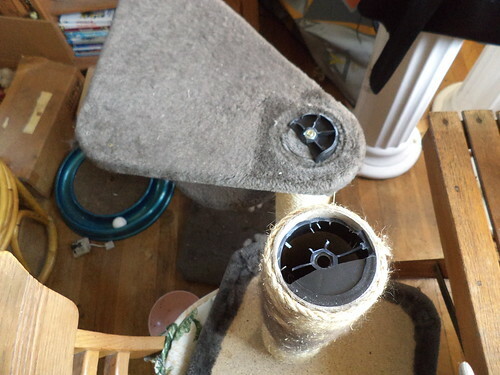 I dashed into the living room to find the cat tree in pieces and Pilchard behind the recliner. My first order of business was to ascertain if she'd been injured. I wish there was a way to let a pet know that you aren't mad at them and they won't be punished for some things. She had to be tempted out from behind the recliner with a couple of treats. She was fine. Time to examine the tree. Well, that's quite the break. I would guess Pilchard was on the top tier or wanted to get onto the top tier and it snapped. As it toppled, she jumped. Agile as cats are, even one as large as Pilchard, she landed safely away from the tree as the top tier went one way and the rest of the tree fell over. Posting the photo to my Facebook feed, I ruminated that I don't think I can fix this. In actuality, Pilchard preferred the tier below the top tier. It's right in line with the table and with me. The tree was always a bit wobbly and she wasn't always comfortable jumping up onto the top. I've seen her lying on the middle tier quite a bit since the top snapped off. Friends have suggested Gorilla gluing the broken pieces back together. I'm thinking that's not really going to be a long term solution. I think the plastic is going to fracture again because of the stress of a large cat trying to jump onto the tier. But what I know she misses is the sisal scratching post. What I think I will do is take apart the tier that broke and Gorilla glue the post back onto the middle tier. The stress from scratching is not likely to fracture the plastic any time soon. Maybe put the carpeted top tier inside one of their boxes for use as a bed. There is a ball that dangled from the top tier. Pilchard played with it a bit. Without the tier, there may be more creative opportunities to attach things to the top of the post which could be batted about. In the days after Christmas, I looked at buying a new scratching post. But I don't have room for one and this is perfect for my small space. I need to put both of them on the post and reassure them that this is stable and they can lie on it. Mija wasn't really one to do anything other than stand on the middle tier. Pilchard had claimed this. I think it still functions for my household and it will be more stable for a 13 pound cat to use. Poor Pilchard, bet she was really startled. Good luck with the re-tooling.